Since the first demonstration of the Virtual Robot Competition, USARSim has been used as the simulation interface and environment. The underlying simulation platform, Unreal Engine, has seen three major upgrades (UT2004, UT3 and UDK). These upgrades required a whole new USARSim simulator to be built from scratch. Yet, between those versions the USARSim interface has not been modified, which made USARSim a stable platform for more than 10 years. This stability allowed developers to concentrate on their control and perception algorithms. This paper describes a new prototype of the USARSim interface; implemented as plugin to Gazebo, the simulation environment native to ROS. This plugin would facilitate a shift of the maintenance of the simulation environment to the Open Source Robotics foundation and attract new teams to the Virtual Robot Competition. 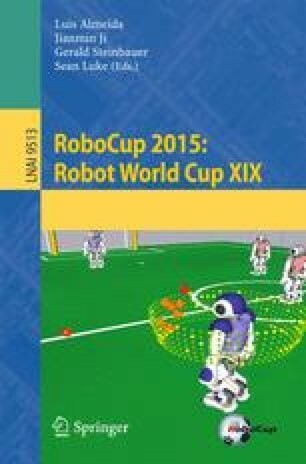 This project was supported by RoboCup Foundation.